If there’s one thing I’m lazy about – I have to admit – it’s putting on body moisturiser. I don’t know who else agrees but getting your hands covered in lotion, having to go back in for more and slathering it all over is a process I wish I could do without. Plus, I always seem to get way too much on so I get that clammy “too much lotion” feeling pretty much the whole day. I hate it. But, thankfully I’ve discovered an new innovation thanks to Vaseline and that’s the Vaseline Spray Moisturiser! I actually first spotted this product in the drugstore called Superdrug in London and now it’s hit Singapore shores. How awesome! The Vaseline Spray Moisturiser claims to be a quick absorbing and convenient lotion that gives you a continuous spray for easy application and all over coverage. The unique formula is also infused with micro-droplets of Vaseline Jelly which leaves your skin soft, non-greasy and non-sticky. When I saw that the formula was infused with vaseline jelly, I seriously got super excited because I use Vaseline like no other. 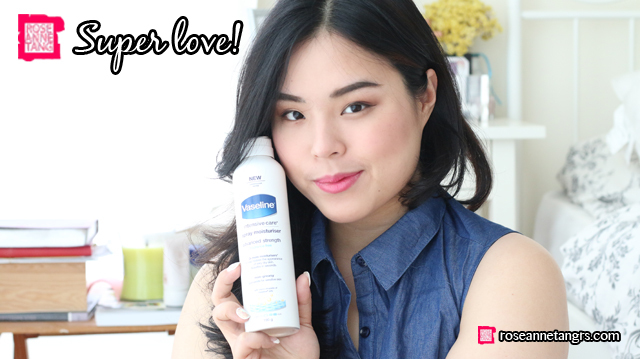 I slather it on myself like no tomorrow so I was really happy that this stuff has one of my all time favourites! There are in total three varieties – Aloe Soothe (green color), Advanced Strength/Fragrance Free (white color) and the Deep Restore (yellow color). I like my lotions simple so my favourite one is the Vaseline Intensive Care in Advanced Strength which is suitable for sensitive skin. Plus, I really need all the moisture I can get. 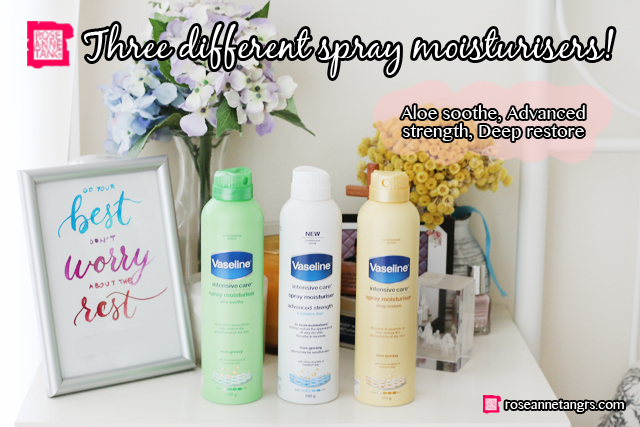 Unlike other sprays, the nozzle for these spray moisturisers are amazing. 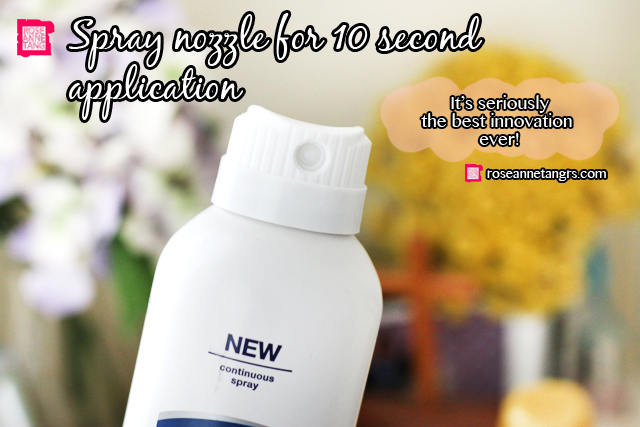 It’s a twist nozzle so it’s convenient that you’re not having to pop the cap off every single time. And I have to say it’s a very superior spray. 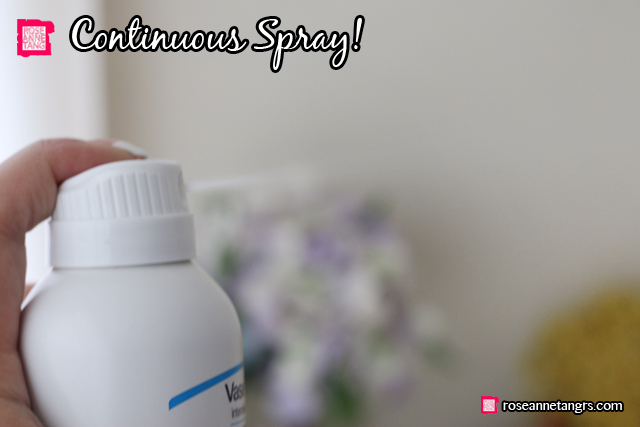 I love how fine the spray is which helps this moisturiser to give you all over coverage. I half press down to give me just the right amount and move it up and down my arms and legs. It’s so easy. I thought that it would be harsh on my skin because of the spray and I thought it wouldn’t be the same but I was wrong. It can easily substitute whatever body moisturiser you’re using right now. After the spray, I just run my hands quickly through it and I’m ready for the day. It probably will take you 10 seconds to get it done. GAH, this is the best innovation ever! Overall, I highly recommend this product. Changed my life really. Now I can get the moisture I need, easily and super fast. Hope you enjoyed this review! Thank you to Vaseline for helping me rediscover my love for this amazing spray again. roseannetangrs review: Rachel K Cosmetics Color Control Blemish Balm (Rachel K CC Cream)! & How To Apply BB Cream! Sephora Haul: Skincare & Foreo Luna Giveaway!